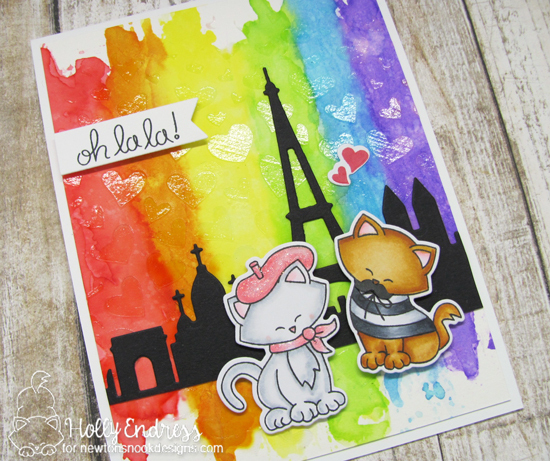 Hollybeary Creations : oh la la! Happy Tuesday everyone.. I'm up on the Newton's Nook blog today with a Fun card featuring a Watercolor background with texture. I started by creating the background with some Distress Inks. I added the ink with a piece of acetate starting with the Red and Purple first then working inwards. Once the background was dry I added some Matte Transparent Embossing paste with the Falling hearts Stencil. This gives a subtle texture to the background. 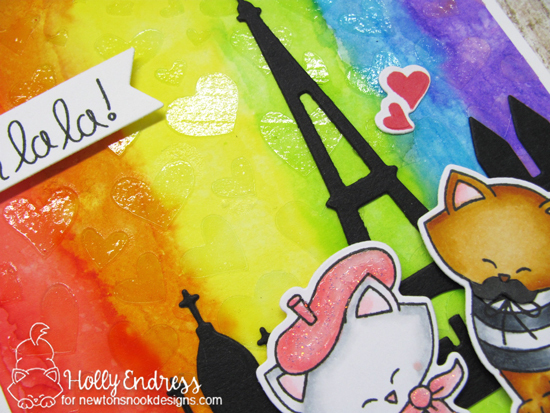 I die cut the Paris skyline die (non NND) from some Black paper and then I adhered it along the bottom of the panel. I trimmed off any overhang and added the panel to a White card base. 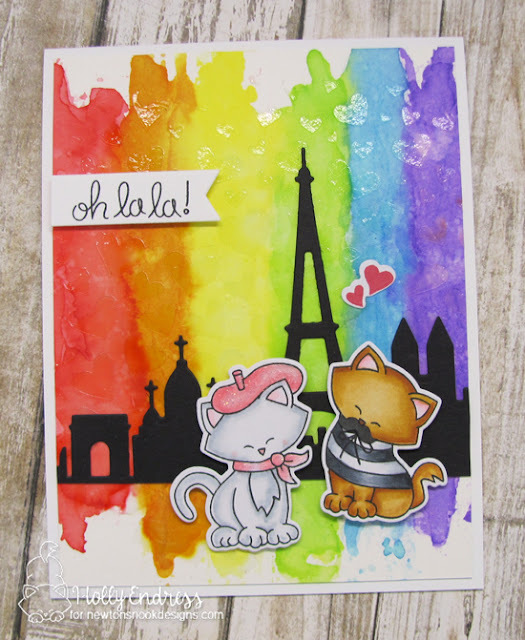 I stamped the images from Newton Dreams of Paris stamp set onto some X-Press it cardstock and colored them in with Copics. I die cut the images with the coordinating dies and added some Pink Glitter Nuvo Drops to the White cat's hat and scarf. I stamped the sentiment onto some White card stock and used a banner die cut to cut it out. I adhered it along the edge with some foam tape along with the Cat images. I love the bold look of the background. Head over to the Newton's Nook Blog for lots of more great inspiration from the team! !